The Silky Gomtaro is a practical, fixed pruning saw. Because it has a fixed blade you don’t have to worry about it closing when you don’t want it to. In addition, when you have a fixed Silky blade you can perfectly align the shape and the ratio between the handle and the blade. The handle is made from a comfortable rubber-like material and feels great in hand. After use or on the road you can safely store the Gomtaro in the sturdy plastic sheath. The sheath has been enhanced with a rubber belt loop. A great aspect of this belt loop is that you use a click system to attach it to your belt. As such you will be able to remove the sheath from your belt without loosening it. Also good to know: the sheath is perfect for right and left-handed use. This coarse version has 8 teeth per 30 mm. As such it is perfect for the more demanding saw work and can easily tackle fresh wood. 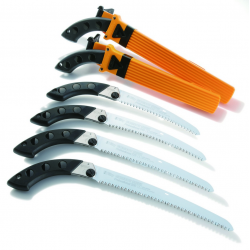 For this saw you can also purchase individual saw blades to replace your old ones. If a Silky saw has been adorned with an impulse hardening symbol it means that the saw has been impulse hardened and that it cannot be sharpened with a file. You can see that the saw has been impulse hardened when you look at the blade and see that the tips of the serrations are black. The Silky blade needs to be kept clean to make sure it stays in great shape. Resin dissolves when it comes into contact with olive oil which makes it an effective, environmentally-friendly product you can use to clean the blade. Please note: aggressive detergents can damage the rubber handle. When you don’t use the saw you should put it in its storage case and store it somewhere dry.